Just another Wednesday morning here on the coast. Aren't we lucky! 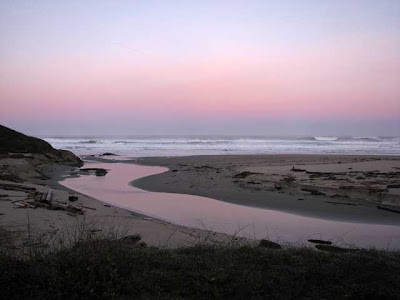 This is Virgin Creek heading out to sea north of Fort Bragg. Yesterday I had to go to San Francisco, to the VA, for a stress test. After ten minutes on the treadmill and fifteen minutes of recovery the doctor pronounce me fit, for an old fart and I am good to go! So, today, I ripped off five miles at 3.4 mph. Life IS good! E-ha! Hey Ron, this is a beautiful photo. Lovely colors and composition.